January is Thyroid Awareness Month. It is not often we see an entire month dedicated to an organ. This is because the thyroid is so important and controls many aspects of our health in a miraculous way. Unfortunately, thyroid disorders are on the rise and extremely common, especially amongst women. In fact, 80% of thyroid disorders occur in women, the most common being Hypothyroidism or Hashimotos (underfunctioning thyroid). The thyroid is a gland that is butterfly shaped and sits partially around the trachea (i.e. windpipe). It produces two hormones (thyroxine (T4) and smaller amounts of triiodothyronine (T3)) in response to Thyroid Stimulating Hormone (TSH) secreted by the Pituitary. You may recognize TSH from your lab test, as it’s the first thing we look at when trying to determine how your thyroid is functioning. T4 is converted to T3 (active form) inside the target cells. When there is enough hormone present, it will signal the hypothalamus and pituitary to stop stimulating thyroid hormone production. The health of your thyroid highly depends on nutrients such as iodine, selenium and zinc. Just as the thyroid is under the control of the hypothalamus and pituitary, so are the ovaries and adrenal glands. The pituitary will release Follicle Stimulating Hormones (FSH) and Luteinizing Hormone (LH) which will in turn tell the ovaries to produce estrogen and progesterone. The pituitary also releases Adrenocorticotropic Hormone and sends a signal to the adrenals to make cortisol (“stress hormone”). A similar negative feedback loop exists between ovarian and adrenal hormones and the hypothalamus and pituitary, just like with thyroid hormone, so when you have enough it will tell the pituitary to stop producing FSH, LH and Adrenocortocotropin. This delicate balance of hormones can be disrupted easily. If one imbalance occurs, all the other glands, signals and hormones in the system are affected. When thyroid is too low, the TSH will be elevated (usually), and when it is too high, the TSH will be low. That can seem confusing at times. A diagnosis of hypERthyroidism is given when TSH is low, and hypOthyroidism when TSH is high. However, this isn’t the end all. Most doctors will only test TSH and maybe T4 and consider this enough to understand your thyroid function. This is an incorrect assumption. You may have poor T4-T3 conversion or high levels of rT3 (which isn’t normally tested). In addition, the range they consider “normal” is between 0.3-5.0 mIU/L. Your TSH levels can be “normal” or within range, however not “optimal”. A comprehensive study of the thyroid is crucial to give us the whole picture. Testing free T4, free T3, rT3 along with thyroid antibodies is critical in understanding how your thyroid is functioning. What do signs/symptoms of thyroid dysfunction look like? As mentioned above, when there is an imbalance somewhere along the web of hormones, all the others are affected. The thyroid levels will influence reproductive hormones, and vice versa. High levels of estrogen, for example, may reduce the amount of active thyroid hormone. Estrogen will increase Thyroid Binding Globulin (TBG) (the protein that bounds T4 and T3 and helps transport them to tissues, but also renders them INACTIVE. When women have hypothyroidism, the thyroid cannot compensate for this shift and symptoms will worsen when estrogen is in excess (as seen in Endometriosis, Fibroids, Progesterone Deficiency, etc). Prescription medications can also affect thyroid function, and these include corticosteroids, beta blockers, barbiturates, statins, and some seizure medications. Now let’s talk about cortisol and how it is linked to Thyroid. Your adrenal glands sit atop your kidneys and secrete cortisol under stress. This is a very normal process in the body, and cortisol will drop once stress comes down. However, when we are under chronic amounts of stress, our adrenal glands secrete more cortisol than usual. This tells the body that it is essentially in a life or death situation and so all of your other “less important” processes in the body shut down (i.e. digestion, immune system, thyroid hormone production, and reproductive system). When your adrenals become exhausted from producing so much cortisol for so long, their function diminishes and you get “adrenal fatigue”. This response will tell your pituitary and hypothalamus to slow down, so less cortisol is produced but consequently less thyroid hormone is produced as well. It will also slow the conversion of T4 to T3 (the active form). This will cause higher levels of rT3 (reverse T3, which is why we test it). Hello HYPOTHYROIDISM! Now this is something I have been seeing more and more in my office. Epstein Barr Virus or EBV is one of the most common viruses that affect our population. Much of the time, this virus goes unnoticed because it is laying dormant inside our liver, thyroid, spleen, or other tissues. Many know EBV to be the cause of the common Mononucleosis. EBV, however, is linked to many other mystery illnesses such as Fibromyalgia, Chronic Fatigue Syndrome, Candida, and yes, even Infertility. With the virus hiding undetected in your organs, your immune system doesn’t realize there is an offending agent biding its time so it returns to its normal activity. Meanwhile, the virus is simultaneously excreting toxic waste matter (or byproducts) known as spirochetes. In addition when the cells of the virus die, the shell leftover is also toxic. As a way to protect itself, your thyroid creates Calcium walls around the virus (creating Nodules on your thyroid). This may seem like a positive thing at first, but the virus adapts and begins using this closed off space to burrow into the thyroid gland and feed off the thyroid, eventually leading to cyst formation. Yikes! Thyroid disorders began showing themselves more frequently when the Industrial Revolution began. It was at this time we started noticing thyroid issues as a result of nutrient deficiencies such as iodine and zinc, and toxicity of heavy metals such as Mercury and Lead. Shortly thereafter, for the sake of progress food industries began stripping our foods of nutrients and packing them into cans, further leading to nutrient deficiencies and Lead toxicity. 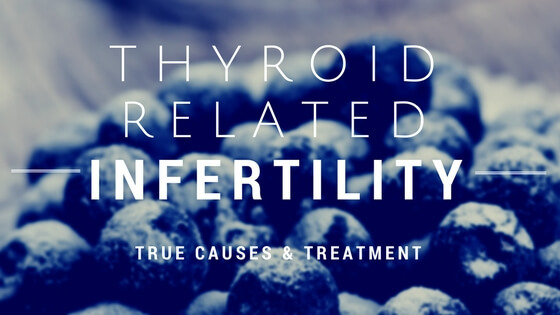 How is your thyroid linked to infertility? Hypothyroidism, the most common of the thyroid conditions makes conception difficult for women due to association with ovarian dysfunction. The thyroid dysfunction will disrupt the balance of reproductive hormones, leading to menstrual irregularities and frequent miscarriage. Hypothyroidism is linked to a reduction in FSH and LH which affects maturation of the follicle and ovarian production of estrogen and progesterone. Lower thyroid levels are also associated with ovarian cysts. We also cannot forget Hashimoto’s Disease, the extremely common autoimmune condition of the thyroid gland which has been linked to frequent miscarriage, preterm birth and neurodevelopmental issues. This is why the thyroid is tested frequently during pregnancy. What can you do to control thyroid dysfunction? Many people are fearful of eating what’s so called “Goitrogenic Foods”. It is well believed by the medical community that foods such as raw cabbage, broccoli, collards, kale and cauliflower can cause further goiter and Hypothyroidism. This is not true. There are not enough goitrogens to inhibit the thyroid. You would have to eat 100lbs of this food daily for it to be concerning. I personally enjoy a smoothie every morning of wild blueberries, cashew milk, hemp hearts, cilantro, dulce, wheat grass, spirulina, and banana. With a link between thyroid dysfunction (especially Hypothyroidism) and reproductive health, it is impossible to ignore when trying to conceive. Abdullatif, HD and AP Ashraf (2006) Reversible subclinical hypothyroidism in the presence of adrenal insufficiency. Endocr Pract. 12(5): 572. Acharya, N (2011) Gonadotropin levels in hypothyroid women of reproductive age group. J Obstet Gynaecol India. 61(5):550-3. Arafah, BM (2001) Increased need for thyroxine in women with hypothyroidism during estrogen therapy. N Engl J Med. 344(23):1743-9. Galofre, JC and TF Davies (2009) Autoimmune thyroid disease in pregnancy: A review. Journal of Women’s Health. 18(11):1847-56. Legakis, I, et al (2001) Elevated prolactin to cortisol ratio and polyclonal autoimmune activation in Hashimoto’s thyroiditis. Horm Metab Res. 33(10):585-9. Mansourian AR (2013) Female reproduction physiology adversely manipulated by thyroid disorders: a review of literature. Pak J Biol Sci. 6(3):112-20. Parsons, V. and I. Ramsey(1968) Thyroid and adrenal relationships. Postgrad Med J. 44:377-84. Thangaratinam S, et al (2009) Association between thyroid autoantibodies and miscarriage and preterm birth: meta-analysis of evidence. BMJ. 342:d2616.